Sensitive skin. Nourishing and protecting. Calms delicate skin. Fragrance-free. Also suitable as eye make-up remover. Certified natural facial care. Free of synthetic perfume, colourants and preservatives. Free from mineral oil ingredients. 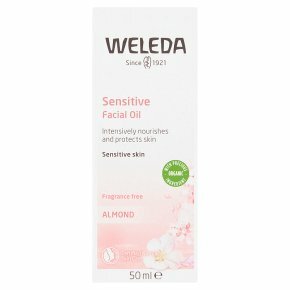 Almond Facial Care The products in this unperfumed range, specially developed for sensitive skin with organic almond oil, restore the skin's balance and revive its natural protective function. Carefully selected natural substances alleviate areas of irritation and reddening typical of sensitive skin. Almond Facial Care protects sensitive skin just as the organic almond has a shell to protect its kernel. Soothing Facial Oil The fragrance-free Soothing Facial Oil boosts the protective functions of sensitive skin. Massage a small amount into moist skin. For removing eye make-up, use with a moist cotton wool pad.